Even with his lack of turf experience, the track handicapper assigned him high weight of 134 pounds. He would be spotting the field anywhere from 12 to 22 pounds. Add to that, his competition included Australian champion Tobin Bronze; Flit-to, the 1967 winner of the U.N.; multiple grass stakes winner More Scents; Irish Rebellion, winner of the Pan American Handicap; and the the 1967 D.C. International winner and turf champ Fort Marcy. But, with all that talent in the race, it was the 30 to 1 Advocator (carrying only 112 pounds) who gave Dr. Fager one the toughest races of his career. Advocator had won multiple stakes on the dirt and finished second in the 1966 Kentucky Derby. While untested on the turf, Advocator had the blood to run well on the weeds, his sire – Round Table – was (and is) considered one of the best grass horses in American racing history. Dr Fager earned his PhD in courage at the Atlantic City Race Course Wednesday. “Hooked from start to finish by lightweight Advocator for the mile and three-sixteenths of the $100,000 United Nations Handicap, this super horse called on all of his courage in the final yards to best his determined foe by a neck at the wire. “It was a brilliant performance by a brilliant horse, and his trainer John Nerud called it ‘Dr. Fager’s toughest race,’ as he toasted his champion an hour after the important victory. “Dr. Fager was sent off at 4 to 5 by the 16,557 fans, and the odds would been a lot less if it were not his first test over the infield course. “Two Panamanian riders Braulio Baeza aboard Dr. Fager and Laffitt Pincay Jr. astride Advocator, sent their steeds out of the starting gate together. Image: Clip from the Atlantic City Press listing the writers covering the 1968 U.N.
Advocator had the hedge and Pincay made good use of that advantage to save every inch of grass, while Baeza had Dr. Fager away from the hedge. In most of his races, except when he is opposed by the ‘rabbit’ Hedevar, Dr. Fager is able to steal away from his foes early and go winging along on his own pace, until Baeza asks him for something extra to ward off any challenges by the late runners. “But Pincay and Advocator did not allow that to happen in the spectacular UN. Pincay kept Advocator right alongside Dr. Fager down the backstretch, applying pressure every step of the way. Leaving the backstretch, Pincay applied extra pressure on his own horse and took almost a length lead. “However, Dr. Fager responded to that challenge by letting out another notch himself to regain a slight advantage entering the stretch. But still Ada L. Rice’s Advocator refused to fold before the Horse of the Year. Back he came along the inside to shove his determined head in front again with about and eighth of a mile to go. “Now it was Dr. Fager’s turn to show the enthralled racing fans why he deserves his many accolades. Even though the softened grass and the 134 pounds and the 22 pounds he was conceding his rival were working against his making the lead again, make it he did. “Dr. Leon Levy, chairman of the board at Atlantic City Race Course, called Dr. Fager’s victory, ‘My greatest thrill in racing. It was a stirring performance by a great horse. We have never had a better horse race or a better horse run over the track. It was a very moving as those two battled to the wire and Dr. Fager stuck his neck out to victory. I certainly would not have liked to see him lose here. He’s a great champion. After his grueling win in Atlantic City, Nerud gave Dr, Fager nearly two months off before entering him in the Vosburgh at Aqueduct. On November 2, 1968, in the final start of his career, Dr. Fager finished first under an astounding 139 pounds. He completed the 7 furlongs in 1:20 1/5 – breaking the track record and missing the world record by only a fifth of a second. UPDATE: Ron Micetic was kind enough to scan and send along the program cover and page from the 1968 United Nations (below). Ron shared a copy of the program from War Admiral’s maiden win a few months ago. Thanks Ron! Check out more history of the United Nations and Round Table in a post from last year. I will be in the house for this year’s running of the United Nations at Monmouth on Saturday — very much looking forward to it. The best I've read since I've found this little corner of the web. I was just a toddler so I never saw the Good Doctor race back then – but what a serious race horse! In so many of his great races he met some formidable rivals and took care of them with aplomb. "'I believe that Dr. Fager proved that he is the Horse of the Year, the horse of any year, out there today,' commented the happy trainer. 'It was his first trip on the grass and last night's rain certainly didn't help him. I would have liked it much more if it had not rained and the footing had stayed a bit firmer. 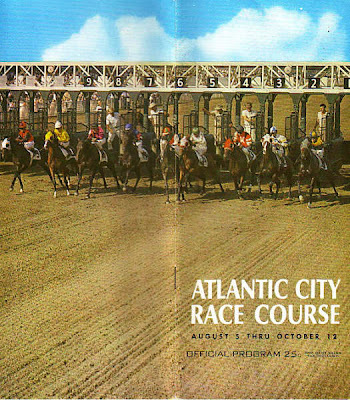 But Dr. Levy [Chairman of the Board, Atlantic City Racing Association] was counting on us to go. Guess who could use that line of reasoning in 2009? I don't say it often enough but I'm reading your pieces with interest each time you post. It inspires me to a UN International piece. Thanks. I'm not sure, is it JJ/SA (Rachel's camp) or JM/JS (Zenyatta's connections)??? Yes, I too was thinking about the connections of Rachel A and Zenyatta and how it would be nice if they had a trainer like Nerud. That is an old school way of thinking that is hard to come by these days. Although Jess Jackson showed some signs of it with Curlin — seems like the BC last year knocked it out of him. We'll see! due to some Louisville H2O. Also, I was wondering if Ron Micetic is the same Mr. Micetic who used to post on the Derby List message boards a few years back? One of the greatest races that I saw in person. I thought he was beat in the stretch but came back strong. He was a wild horse with his mane flying back as he passed advocator. I also saw Secretariat several times and have a wining ticket from his victory in the Malboro Cup. 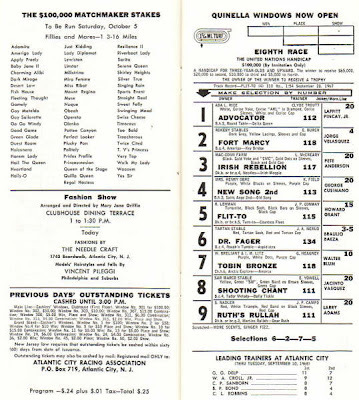 Saw Ruffian beat Hot ‘n Nasty in the 74 Sorority at Monmouth; also saw her beat Equal Change in the coaching Club at Belmontband was there when she broke down on July 6, 1975 Stil have the buttons they gave out. My three favorite horses in 44 years of attending races. IMO, Dr Fager was the most versatile, Ruffian the fastest, and Secretariat the best at over one mile.